Online communities have become an essential tool for brands to meet the challenging expectations of their customers. Increasingly, selecting the right community platform vendor is critical to success in customer experience. 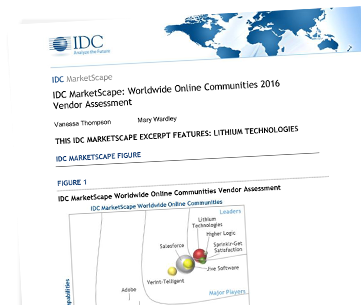 In its recent MarketScape for Online Communities report, research firm IDC has recognized Lithium as a leader, with a strong reputation in community solutions and a commitment to helping brands drive success. Supports data-driven social engagement and personalized recommendations that help brands build deeper connections with their customers. Download the report, and learn why Lithium has received the highest customer satisfaction response and recognition for its customer base, consisting of more than 300 global brands and including numerous Fortune 500 companies.